Robert Beverley, ca. 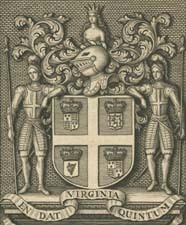 1673-1722 The History and Present State of Virginia, In Four Parts. I. The History of the First Settlement of Virginia, and the Government Thereof, to the Present Time. II. The Natural Productions and Conveniencies of the Country, Suited to Trade and Improvement. III. The Native Indians, Their Religion, Laws, and Customs, in War and Peace. IV. The Present State of the Country, as to the Polity of the Government, and the Improvements of the Land. By a Native and Inhabitant of the Place. The History and Present State of Virginia, In Four Parts. I. The History of the First Settlement of Virginia, and the Government Thereof, to the Present Time. II. The Natural Productions and Conveniencies of the Country, Suited to Trade and Improvement. III. The Native Indians, Their Religion, Laws, and Customs, in War and Peace. IV. The Present State of the Country, as to the Polity of the Government, and the Improvements of the Land. By a Native and Inhabitant of the Place. London: Printed for R. Parker, 1705.